New from Gemtech this year at the SHOT Show Industry Day at the Range was their new INTEGRA Integrally Suppressed Upper Receiver and the new LUNAR-45 Suppressor. The INTEGRA, which is available in both 5.56mm and .300BLK, offers Gemtech’s G-CORE Technology that is removable, cleanable and replaceable as well as a Gemtech/Nemo Arms patented gas block which eliminates blowback. The pictured Seekins Precision Rail is standard. The INTEGRA was sound tested at 128 dB in .300BLK and features a 10″ barrel with an Integrated Length of 16.1″ (OAL). In 5.56mm, the INTEGRA was sound tested at 131 dB and features a 10.5″ barrel with an Integrated Length also of 16.1″ (OAL). Both caliber versions are Full Auto Rated. The INTEGRA will MSRP around $1899. The LUNAR-45 pistol suppressor is modular and can be configured in two lengths, 6.9″ (Short) and 8.5″ (Long). It is registered in the 8.5″ length. The LUNAR-45 sound tested for the .45 at 129 dB (Long) and 136 dB (Short) and for 9mm, 128 dB (Long) and 132 dB (Short). The LUNAR-45 will MSRP around $799. SilencerCo’s SPEQ® (Service Proven Equipment) program is our way to say thanks to the first responders, law enforcement, and members of the military who serve and protect our country. In observance of Veteran’s Day, SilencerCo will be opening up the SPEQ program to all who have served – both past and present – for the rest of 2016. If you are currently serving or are a veteran with a DD214 who was Honorably Discharged, you can take advantage of the SPEQ program not just for the month of November, but until December 31 at 11:59 PM Eastern Time. Through their partnership with B&H Police Supply, SilencerCo is showing their appreciation for the silent heroes and helping them to #FightTheNoise. For more information and to find out how to place an order, visit www.silencerco.com/speq. (Melbourne, FL) May 9, 2016 – FightLite® Industries, a special products division of ARES Defense Systems, Inc. announces their new patent-pending STEP-22LS™ (Strategic Target Engagement Pistol, Low Signature). The STEP-22LS™ is an accurate, rugged, lightweight and reliable monolithic pistol receiver chambered in .22LR and features a tensioned target barrel with integral silencer and MIL-STD-1913 Rails at the 6 and 12 o’clock positions for mounting lights, lasers, optics and other accessories. Designed for military, law enforcement and civilian shooters; the STEP-22LS™ is optimized with features ideally suited for the modern warfighter, law enforcement professional and avid civilian shooter who demands cutting edge performance from their weapon. Boasting an incredibly short overall length of only 11” and weighing a mere 24.3 oz; the STEP-22LS™ provides excellent sound pressure level reduction (up to 40 db) from a silencer that is integral to its patent-pending monolithic receiver body delivering extreme performance in a compact and lightweight package! The tensioned target barrel dampens accuracy degrading harmonics typically associated with lightweight barrels for excellent and repetitive shot placement. And the patent-pending STEP-22LS™ monolithic receiver ensures that there are no sight rails or tubes to loosen during firing. Military, law enforcement and civilian shooters alike will appreciate the ability to place well-aimed, undetected shots in low light and no light conditions. Avid shooting enthusiasts in 42 states can enjoy target practice and general plinking with the STEP-22LS™ without the need for additional hearing protection; and ranchers will welcome the ability to place accurate shots with the STEP-22LS™ for dispatching rodents or injured animals without spooking their livestock. Additionally, certain high-threat law enforcement scenarios require the dispatching of guard animals, disabling street and porch lights or cameras to maintain the element of surprise with a well-placed and undetected shot prior to executing an arrest warrant. All STEP-22™ models are designed to readily interchange with the standard pistol receiver on popular RUGER® Mk-I®, Mk-II®, Mk-III® and 22/45® pistols without any tools or gunsmithing required, providing users with a lightweight pistol capable of accommodating lasers, lights, optics and accessories on monolithic rails that won’t loosen during use. Installation of any FightLite® STEP-22™ monolithic receiver on a RUGER® Mk-I®, Mk-II®, Mk-III® or 22/45® pistol is easy and straightforward. Simply follow the unloading and disassembly instructions specified in the RUGER® manual for your pistol. Once disassembled, set your RUGER® upper receiver aside and reassemble your pistol with the FightLite® STEP-22™ monolithic receiver assembly using the original RUGER® bolt and trigger housing from your pistol. It’s that simple! MSRP is $699 and FightLite® Industries is accepting orders for immediate Form 3 transfer to FFL/SOT dealers and distributors. Product will be available to ship to customers as early as July 1, 2016 pending ATF transfer approvals. To handle the STEP-22™ and other ARES Defense and FightLite® Industries products, please visit the ARES Defense/FightLite® Industries booth #4808 at the NRA Annual Meetings May 20-22, 2016 in Louisville, Kentucky or at booth 748 of the SOFIC Convention May 24-26. Origin 100% Made in the U.S.A.
FightLite® Industries is a special products division of ARES Defense Systems, Inc. Since its founding in 1997, ARES Defense Systems has focused on the development of military small arms and accessories of unique versatility, innovation and exceptional quality for military, law enforcement and commercial customers. Engineered and manufactured with the highest quality American-made materials, ARES products are produced on state-of-the-art CNC machining centers in an ultra modern facility by a highly skilled workforce. Headquartered on the USA’s Space Coast, ARES’ intense dedication to mission critical innovation has resulted in numerous patented advancements resulting in lighter, stronger, better performing weapons and accessories for the operator. To learn more about FightLite® Industries visit www.FightLite.com. Follow FightLite® Industries on Facebook at facebook.com/FightLite and on Twitter @FightLite. To learn more about ARES Defense Systems visit www.aresdefense.com. Follow ARES Defense on Facebook at facebook.com/aresdefense and on Twitter @ARESDefense. Notice: FightLite® is a registered trademark of ARES Defense Systems, Inc. RUGER®, Mk-I®, Mk-II®, Mk-III® and 22/45® are registered trademarks of Sturm, Ruger & Co. 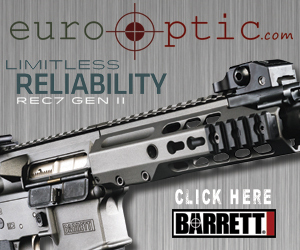 Accessories shown such as 22/45® grip frame and parts, optics and laser light are not included with product purchase. Introducing the Hybrid™ – the silencer for any platform. Compatible with pistol calibers from 9mm to .45 ACP, rifle calibers from 5.56mm to .45-70 GOV and .458 SOCOM, and many in between, the Hybrid is both full auto and magnum-rated and can be used on pistols, rifles, and submachine guns. Boasting low-120s dB on .300 BLK and remaining hearing safe with .45–70 GOV, the Hybrid offers an unparalleled pairing of versatility and performance – a combination you’ve come to expect from SilencerCo products. The Hybrid is rated down to 16″ barrels for .45–70 GOV and .458 SOCOM and down to 18″ barrels for all magnum calibers up to .338 Lapua Magnum. Accessories: Click HERE for a quick-reference poster of all Hybrid accessories. The following is a Press Release from SilencerCo covering their Black Friday Sale and much more. Beginning at 12:00 AM on Black Friday (November 27, 2015) and going until 11:59 PM on Cyber Monday (November 30, 2015), SilencerCo™ will offer a variety of items through our webstore at substantial Black Friday discounts. Prices on all accessories and merchandise will be reduced by 35% during this sale – including our new line of fall merchandise. With our assortment of everything from flannels and beanies to hoodies and dresses, we’ve got you and your family covered from the city to the back country this season. For a limited time, SilencerCo’s Harvester™ 220gr and 208gr subsonic 300 Blackout ammunition will be sold for only $19.95 per box! Get the quietest, most accurate 300 Blackout ammunition available anywhere for the best price ever! What’s more? Every person who orders Harvester ammunition throughwww.SilencerCo.com will be entered to win a free Omega. Congratulations to Luis P. from FL for being this week’s winner! We will select one Omega winner at random per week. Each customer will receive one entry per box of Harvester ammunition ordered – MORE BOXES PURCHASED = MORE CHANCES TO WIN. Also included in the SilencerCo Black Friday Sale is a new SilencerCo threaded barrel for the VP9 at the same 35% off retail discount. Ships with custom SilencerCo thread protector. Silencerco has an unique approach to their new Integrally Suppressed Maxim 9 Handgun with character Hiram Maximus. Though in true Hollywood fashion, I doubt the Maxim 9 has a 29 round magazine. Finding a holster for the Maxim 9 will probably be a little difficult, but I’m sure that if this is successful, that one will not be too far behind. Watch the video below for the intro to the Maxim 9. SilencerCo is now offering an “Easy Trust” which is 50-State legal and at a cost of $129.99. The trust will assist with the legalities of NFA purchases and should even speed up the process by bypassing the Chief Law Enforcement Officer signature and the Fingerprint Card. Available for purchase now and will ship out on the 15th, SilencerCo now has added the Glock 19 to the list of available threaded barrels. The 416R Stainless Steel barrels feature a 1/2×28 Thread with a 1:10 RH Twist and is finished in Black Nitride. The barrel retails for $220.00. The models currently available are for the Glock 19, Glock 17 and Glock 21 with the Glock 17L, Glock 34, Sig Sauer P226, Springfield XD, and Smith & Wesson M&P versions to come out soon. For more information visit SilencerCo.